Lux Interior: inter-dimensional, pan-sexual, time-traveling rock & roll alien. And radio host. 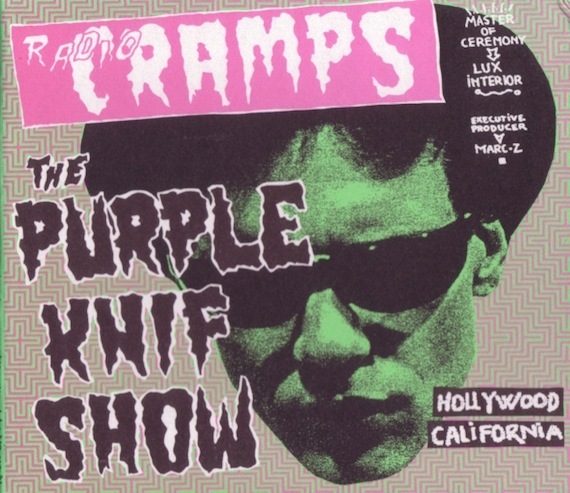 As Halloween draws nigh we’re revving up for our annual airing of The Purple Knif Show, the one-off radio program hosted by Lux in 1984 deep in the bowels of Hollywood. As master of ceremonies, Lux runs through his personal archives spinning the weird ranging from rockabilly and garage to early punk, campy novelty and exotica. His bag of tricks was the best. So go ahead, “get out your magic decoder rings, boys and girls…” Trick or treat. Absolutely amazing collection! Totally recommend these additional mixes on Beware of the Blog too! This is ridiculous….reminds me of old Ghoulardi hijinx. If anyone has a stable alternative to medafire for this kind of stuff, let us know. Loving these! Now have Vol. 5-8. Any plans for a second chance resurrection on 1-4? Thanks for posting this! You may want to try zippyshare. Other blogs are using it, and it works quite nicely. No waiting times, no limits as far as I can tell.